over 24 years and is considered to be Mr Esprit. A. 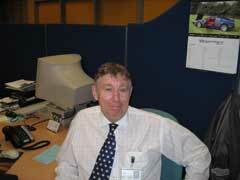 From leaving school I was an apprentice at Rolls Royce Aircraft Engines as development engineer. Working there for 10 years. A. I joined in 1979 as a powertrain development engineer. A. The Esprit was 3 years old when I joined Lotus. I'd seen them on the road and thought of it as a stunning vehicle. Working on them was a privilege (and still is), as it wasn't your everyday sort of car. A. The development of the Renault gearbox for use in the Steven model. All the development work was done on two Giugiaro Esprit, one turbo and one normally aspirated. A huge amount of durability work was done during testing, with around 100,000 km done on each box. This testing was done on public roads all over Europe including, Germany, Switzerland and Italy, with me at the wheel on occasions. This including Alpine climbing and high-speed autobahn running. No road incidents occurred during over 200,000km. A. I remember a huge amount of dyno work done for piston development. There was an enormous amount of piston design changes before the final design was proven. We were really pushing the boundaries at the time and leading the field in turbo development. A. He was the most dynamic man I've ever met. You couldn't help but want to work with him and wanting to be just like him. When the Lotus F1 car was banned (regulation changes) Colin lost a little bit of interest in the sport and was looking for something else to get into. I worked with him on the microlight engines (2 & 4 cylinder). The design concept for the frame was from the US, but the engines were pure Lotus and we actually had the microlights flying with Lotus engines. A wonderful time. A. I was project manager for the Esprit S4, this involved all the body exterior and interior updates, new wheels, power steering, new window lifts, door mechanisms. This was the point in the Esprit production life where we could change a massive amount on the car and really increase its quality. With the GM parts bin and access to their suppliers it opened up all sorts of possibilities for the Esprit. Before simply changing the door handles would have meant crash testing the Esprit incurring large costs. Now we could source the parts from GM which had already been approved. The outer door handles are actually off an Omega, but the inner's are Calibra as we didn't want to use the door pins commonly found on the Vauxhall line. We also strengthen the doors and change the window lifter motors, which incurred regular failures. These were sourced from the Vauxhall Carlton, the US version couldn't have the single switch lifters, so we used a Holden part, which is another GM company based in Australia. With most of the other major sports car manufacturers having parent companys to help with parts and suppliers, we could now complete better in the market. A. Knowing that a prototype V8 had been developed and was running in development vehicles, we felt that the performance of the 4 cylinder vehicles stood up well against other V8's on the market. Also to step to a V8 for the production car, would have incur massive costs and development for little performance gain. A. We always had Porsches and Ferrari's around for assessment. This including ride and handling, exhaust note, interior noise etc. assessment to compare with our Esprit. This also help with looking at market trends and wasn't used to develop the vehicle as such. It wasn't a case of copying as Lotus always wanted to be leading, but seeing how the market was developing and it which direction it was heading. A. Finding an available transaxle is difficult, finding one that would fit is more difficult, then finding one that would handle the torque is still even more difficult. You then need to have them available long term. This left options limited and we found Renault helpful with development of the box which has been satisfactory. Development of a in-house transmission would have involved an enormous cost. A. Most of the money is spend on emission compliance (world-wide market vehicle). Safety system are also mandatory for US markets, which again take up huge amounts of time and budget. Ride and handling is also a major part of Esprit developed, which is done on-site and using many European facilities. A. 4 cylinder. 'I think it makes the driving experience more involved.'. A. There's always a limited budget for a low volume car. Most goes on emissions compliance and safety regulations. Some of the legalisation costs render some proposals not to be viable, this then restricts the development of the vehicle. We keep a database of updates we'd like to develop, and what is needed to implement them. When legal requirement force the use of certain testing facilities, we can then check the database out and see what else can be done at the same time to improve the Esprit using the facilities. A. The most significant change was the GM take over, which gave us the power with the suppliers and the parts availability to really develop the car. Legalisation costs were less of a concern given GM's component validation assistance, meaning lower development costs and reduced tooling costs. A. Some is justified, but it's a tradition to knock Lotus, so we're not that bad really. A. Esprit S4s (Norfolk Yellow). The best 4 cylinder Esprit. A. It's a great circuit, developed to exploit cars handling. I've spent many hours there and on the road. A. Power steering was considered the best in its class at the time. And I was heavily involved in its development. A. It wasn't news, it had been stopping for years. Every year and for the last five. This time was for real, which is sad, but maybe the right time. A. It's got to be a step forward, and better in every feature. A. Looking after the Esprits already out there, leaves me plenty to do. And we are also getting involved in the Elise. And hopefully the new Esprit in the future. A. ABS testing in Sweden for the Esprit V8, but lots of the early work was done on a couple of S4s including the Sweden trip. Driving an Esprit on frozen lakes testing on low grip surfaces is very challenging. Driving from the town we were staying to the test site on hard packed snow was very exciting. Also the drive from Hethel to the test site in Sweden was very memorable. I would personally like to thank Brian for agreeing to this interview and giving up his valuable time. I was also shown around the factory and the Esprit production line during my visit to Hethel, gaining valuable information and meeting some of the people that have put together your Esprits. I have invited Brian to any of LEW's future events, so we hope to see him in the future. The views contained in this page are those of Brian Angus and not of the Factory, Lotus Cars Ltd or Lotus Engineering.